Gethin Butler wins Blackpool Marathon. Some fans of Gethin in both Surrey and Lancashire may have suspected as much but it still comes as a surprise that he is faster than Lance Armstrong. In winning the Blackpool marathon with a time of 2hrs. 34 mins. Gethin humbled Lance who has a PB of 2 hours, 46 minutes, 43 seconds that earned him 214th place in the New York event. Cav wins time trial ! Roxanne Heijmans brought glamour to the event. 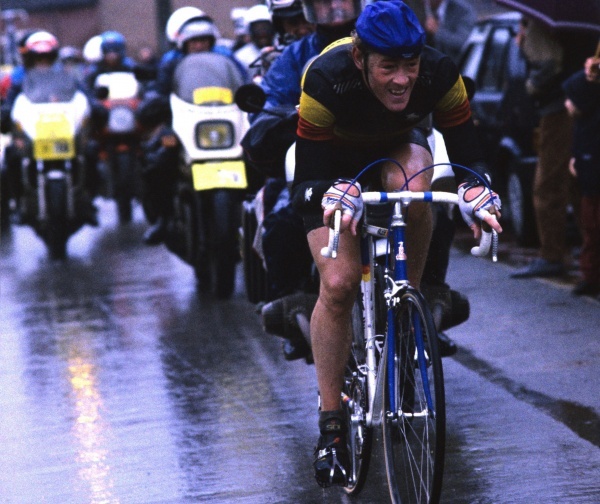 The Manx wonder won the time trial and the overall in the 67th Profronde Made. The event was run in an omnium format with a time trial, criterium and elimination race. In second place overall was Juan Antonio Flecha. The event was held on a 1200 metre circuit so it is unlikely that the time trial would have met the exacting standards of the RTTC. Nevertheless a measure of Cav’s ride is the third place of Stef Clement, twice Dutch TT champion and third in last year’s Worlds time trial. The falling out between Lemond and Trek which is, it seems, about Greg’s refusal to modify his views about Lance Armstrong is heading for court. Papers filed by Trek state, inter alia, that the licence fee paid to Lemond for the use of his name is $350,000 per contract year. A further irritation, Trek allege, is that Lemond took advantage of their employee pricing scheme to purchase, over a nine year period, bikes with a retail value of $2,500,000! They further state that recently Greg ordered two La Victoire models retailing at $5280 each and then sold them to customers that had already agreed to purchase less expensive models from a Trek dealer thereby undercutting the dealer. greenjersey is merely reporting the facts as he understands them without comment on Lemond as a businessman. Super sprinter Mark Cavendish shook the champagne with so much energy at the finish of yesterday’s Scheldeprijs that he threw himself off the podium and landed on his arse. Second placed Tom Boonen appeared extremely concerned that Cav may have injured himself which when you consider that the flying Manxman snatched victory from Tommeke on the line shows what a nice guy the big fella is. It was encouraging to see that five other Brits finished in the same time as Cav. In last week-end’s Sunday Times there was an interesting interview with 1985 London Marathon winner Steve Jones. His views are so relevant to the similar situation in cycling that they are worth repeating. “Now we don’t have running magazines. We have lifestyle magazines, not hard-core running mags. which is what you need to inspire the youngsters. They don’t want to read about knocking three seconds off your best time for having this for breakfast or walking ten more miles to use 500 more calories. They want to read about the top athletes in the world” Steve could be describing exactly the situation with the Comic which has substituted “training advice” and road tests that are little more than thinly disguised adverts for comprehensive reports on the major races. In 1958, as a fourteen year old, I read in Cycling the lap by lap report on the Pro Worlds road race so many times I could quote every detail of Ercole Baldini’s lone win, and much I still can. What is there now to inspire young riders? Reports of overseas jollies by “staffers” (I almost choked on that word) who would be better described as teenage scribblers. I don’t think so. You may well have concluded that greenjersey just trawls the ‘net and re-hashes stuff from other sites and usually you would be right but not this time. Last Wednesday I took the ferry to Dunquerke and although a road diversion meant I couldn’t make it to the Kemmelberg I did see the G-W twice, the second time on the Monteberg. Then into a bar to watch Oscar take a very comfortable win. I then drove to Tournai where I was to stay for five nights. On Thursday I took an easy ride down the river towards Ronse where it got a bit tougher as I tested the old legs on the Oude Kwaremont. On Friday I headed into France where I rode four sections of pave. 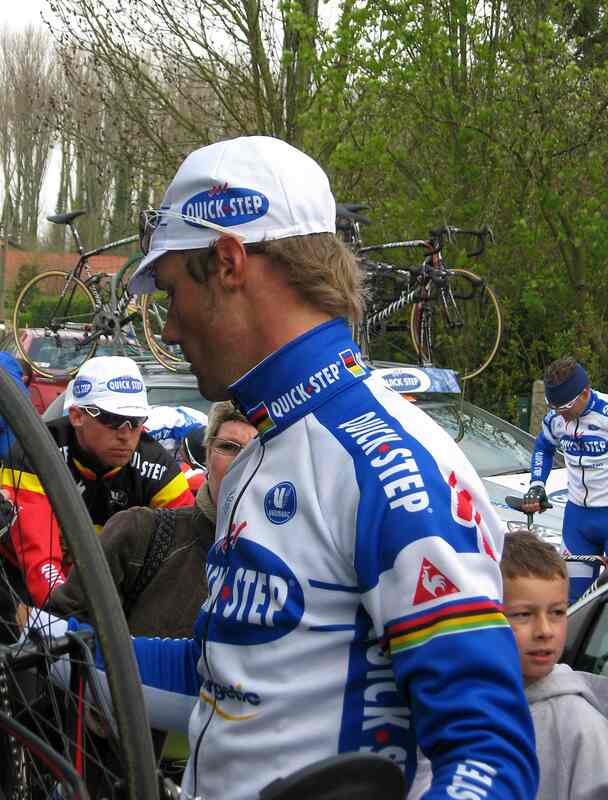 In a small village I came across the Quick-Step bus parked in a side street with maybe twenty fans hanging around. I joined them and ten minutes later the riders returned from a recce on the course. As soon as Tommeke dismounted he carefully checked his tyres and seemed rather worried about something. I took a look and the team were using two similar tyres with either a green or a natural side wall. There was no brand name but moulded into the tread were the words Made in Thailand ! 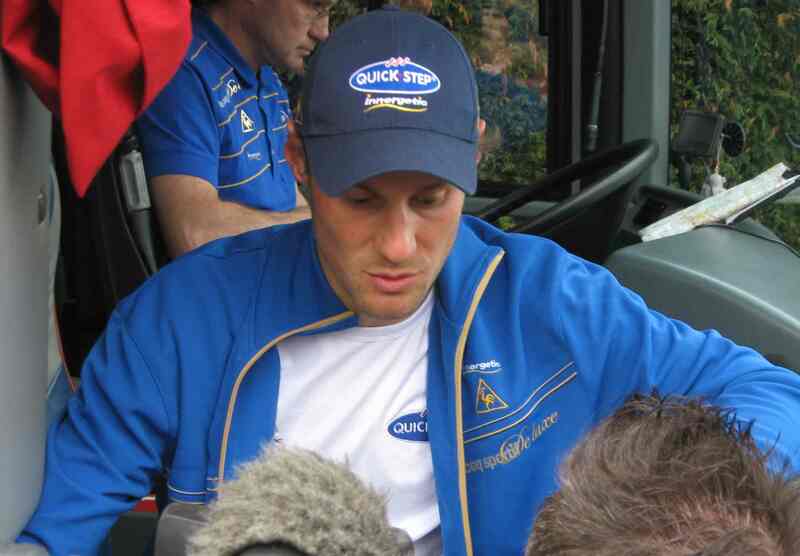 After fifteen minutes Devolder did a TV interview on the steps of the bus. He was asked to speak in French but declined to do so and the interview was in English. 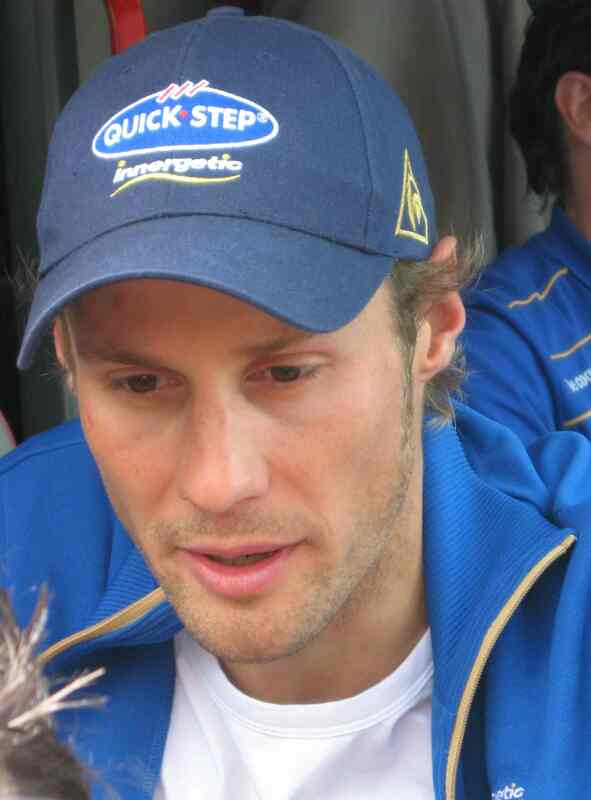 Boonen followed and he was happy to answer in French. On race day I went to Arenberg where I arrived far too early. I decided on the left side of the road but after about thirty minutes the Police moved everybody to the right hand side! Then after another thirty minutes they allowed us to move back again. I suppose French cops, like their English brothers, just like to keep the public, who pay their wages, on their toes. Still I suppose if somebody would pay me a good wage then a big fat pension for standing around chatting to my mates I would be up for it. 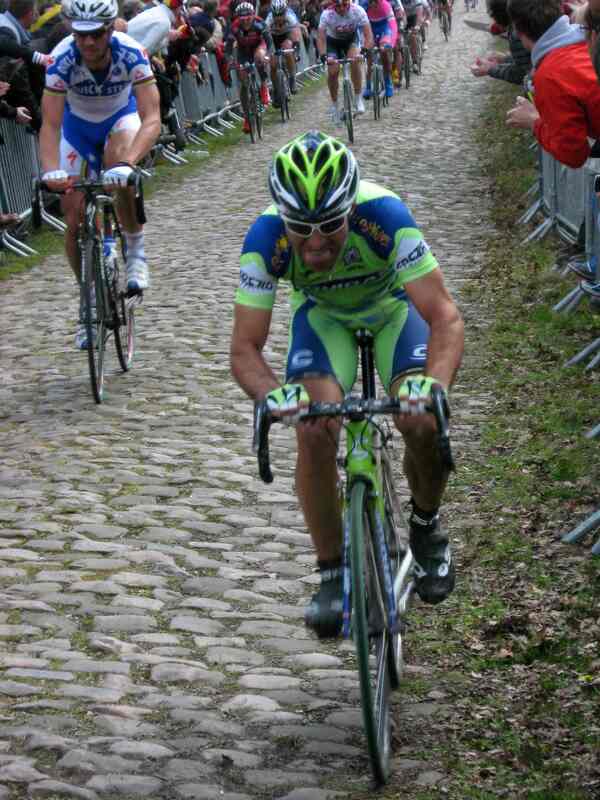 Although I have ridden Arenberg before I had not previously seen the race in the foret. It certainly brings home the meaning of the phrase “on the rivet” The race it one long line of suffering. It was then back in the car and a thirty minute drive to the secteur pave Gilbert Duclos-Lassalle where the big three had a commanding lead. Then, of course, the ritual crowding round a tele to watch the finale. Tommeke certainly had me fooled. 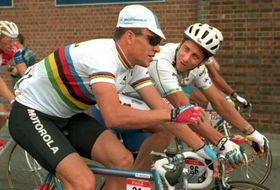 Is Devolder’s win the best since 1985? No thanks due to British Eurosport as I watched the Ronde on a three inch screen on my computer but no praise is too great for Stijn Devolder. He seemed to be sacrificing his chance for Boonen but showed amazing strength and fortitude to win alone. He refused to surrender and each time all seemed lost he attacked again. Tommeke did nothing wrong but he just hasn’t got it in his legs. He had three chances to defend Devolder’s position as first Sebastian Langeveld then Juan Antonio Flecha and lastly Nick Nuyens attacked and each time Tom was unable to follow. And they weren’t futile moves, each showed potential and could have caught Devolder had he been less than super human on the day.